One of the MySQL 5.6 features many people are interested in is Global Transactions IDs (GTIDs). This is for a good reason: Reconnecting a slave to a new master has always been a challenge while it is so trivial when GTIDs are enabled. 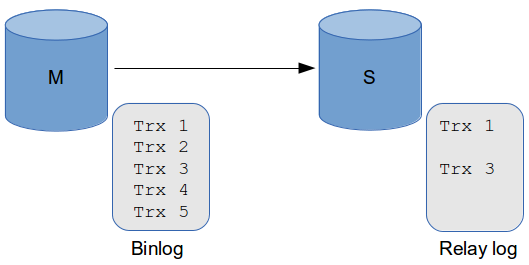 However, using GTIDs is not only about replacing good old binlog file/position with unique identifiers, it is also using a new replication protocol. And if you are not aware of it, it can bite. The old protocol is pretty straightforward: the slave connects to a given binary log file at a specific offset, and the master sends all the transactions from there. The new protocol is slightly different: the slave first sends the range of GTIDs it has executed, and then the master sends every missing transaction. It also guarantees that a transaction with a given GTID can only be executed once on a specific slave. In practice, does it change anything? Well, it may change a lot of things. Imagine the following situation: you want to start replicating from trx 4, but trx 2 is missing on the slave for some reason. With the old replication protocol, trx 2 will never be executed while with the new replication protocol, it WILL be executed automatically. Here are 2 common situations where you can see the new replication protocol in action. Why can’t we use sql_slave_skip_counter? Because of the new replication protocol! Let’s assume that sql_slave_skip_counter is allowed and has been used on S2 to skip trx 2. What happens if you make S2 a slave of S1? If trx 2 is still in the binary logs of S1, it will be sent to S2, and the transaction is no longer skipped. If trx 2 no longer exists in the binary logs of S1, you will get a replication error. This is clearly not safe, that’s why sql_slave_skip_counter is not allowed with GTIDs. The only safe option to skip a transaction is to execute a fake transaction instead of the real one. If you execute a transaction locally on a slave (called errant transaction in the MySQL documentation), what will happen if you promote this slave to be the new master? With the old replication protocol, basically nothing (to be accurate, data will be inconsistent between the new master and its slaves, but that can probably be fixed later). With the new protocol, the errant transaction will be identified as missing everywhere and will be automatically executed on failover, which has the potential to break replication. # This creates a conflict with existing data! # The missing transaction is no longer available in the master's binary logs! GTIDs are a great step forward in the way we are able to reconnect replicas to other servers. But they also come with new operational challenges. If you plan to use GTIDs, make sure you correctly understand the new replication protocol, otherwise you may end up breaking replication in new and unexpected ways. I’ll do more exploration about errant transactions in a future post. 1) You say Slave sends all transaction IDs it has executed and Master sends back all transactions missing. But in practice we’re looking at Slave executing millions and billions of different transaction IDs how is it going to send that to the master ? 2) Send missing transaction is interesting. Lets say I have 1000 transactions and transactions number 5 gone missing for some reason. When slave connects and fetches transaction its changes can potentially conflict with some of the later transactions ? Now if we have full before-after row images we can detect if transaction can’t be executed now, however what is about Statement level replication ? Can we have potentially very old missed transactions to come to haunt us by doing update which was long overwritten ? 1) Ranges of GTIDs are stored as GTID sets, which is a compact way to display large amounts of transactions. Like if slave N has executed trx 1 to 1M from server XYZ, the corresponding GTID set is XYZ:1-1000000. Have a look to the Executed_Gtid_Set field in the output of SHOW SLAVE STATUS. 2) You’re right. 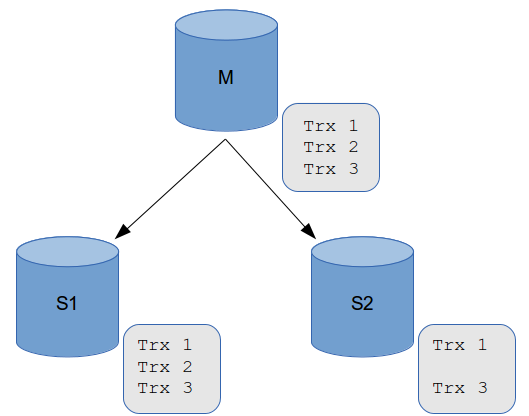 A missed transaction can come back and break replication because it conflicts with another transaction or because the binary log of the corresponding event has been purged. You can also have silent data corruption (an update statement executed a second time for instance). I’m writing another post to give more details regarding the dangers of errant transactions. About missing transaction – would ROW base replication be protected having before -after image at least for changed columns so if data was already changed the transaction would not go, right ? AFAIK a missing transaction is always re-executed (row-based or statement-based replication), but that should be easy to test. I’ve heard mysql 5.6 gtid replication never allow a transaction(gtid) hole. So I can’t understand how the situation(second picture) can happen. As you said, mysql 5.6 gtid managed with SET concept. So if mysql 5.6 allow gtid hole, then mysql 5.6 have to manage a lot of gtid set. But they don’t. They have only one gtid set for single mysql instance(I think). In case of your second picture, what S2’s Gtid_executed field have ? I think this case, show slave status result will be “Gitd_executed : host1_uuid:1,host1_uuid:3” (I think). Anyway thanks a lot . You’re right, the situation in the 2nd picture is not allowed to happen. I wanted to explain that if we could create a hole with sql_slave_skip_counter, it would create problems. So if we want to skip a transaction, what we have to do is to execute a fake one. By doing that, we have no hole in the sequence of GTIDs and we have been successful at not executing a specific transaction. Actually scenario 2 can happen. If master is running gtid and MTS, and crashes for some reason, we can have a situation where upon failover to slave, we find that former master has holes in it’s executed gtid set, while slave has the more complete set. Further more, in any situation where we have errent transactions on the slave and a failover occurs to that slave, we can have master applying errent transactions from slave out of order. This is what baffles me about gtid – it allows out of order execution of transactions even when replication format is statement based, thus resulting in slave drift. Maybe someone could explain how this is not true and gtid does not cause slave drift when slave fetches some very old errent transaction and applies it?